One morning we noticed that one of Squeaky’s eyes was a little bit smaller than the other. We didn’t think it was anything to worry about too much though and decided to wait till evening to see if things got any worse. When I got home from work, Squeaky didn’t come to see me at the front door. Unusual for a cat that’s always hungry. I found him on the sofa, but he barely lifted his head when I went over to him. The poor little thing had a big swollen eye and could barely open it. So off we went to the vet. He rubbed it with some cotton wool, but whatever it was in his eye didn’t come off. He thought it might be an insect that had bitten into his cornea, so he put anaesthetic drops in it waited for them to work and then rubbed it again. The foreign object stayed put, so he grabbed a pair of tweezers. He pulled it and on the second attempt out came a spike from a plant that was about 3mm long, and had been wedged right in the middle of his pupil. Poor Squeaky! No wonder his eye was the size of a balloon. But throughout the whole thing, although he’d wriggled a bit, he’d continued to purr. 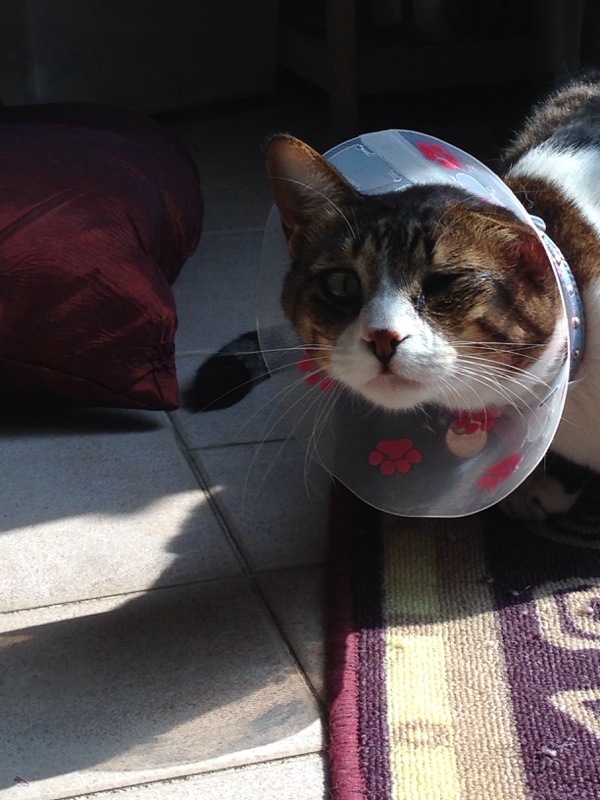 Then, as if to prove it, Squeaky needed to have one of those cones put on his head to make sure he didn’t rub his eye. He couldn’t fit into the one for cats, he was too big. He had to have one for a small dog instead. He can’t help being a gigantacat. We have his mother here, and she’s tiny. I can only assume his father was a small panther. Or a horse. Hmmm. “Unusual for a cat that’s always hungry.” Perhaps there is a clue there to the reason for the dog-like similarities ;-). Or maybe he is just big boned? I’m just hoping that he doesn’t eat because he’s still growing!